A fabulous evening of delicious food, cocktails, salsa dancing and live entertainment in the most beautiful setting at the Humidor, Graycliff. Paddles at the ready as you get the chance to bid on amazing prizes. Spectacular Auction and Raffle Prizes, plus ‘on the spot’ giveaways, just being there gives you a chance to win. 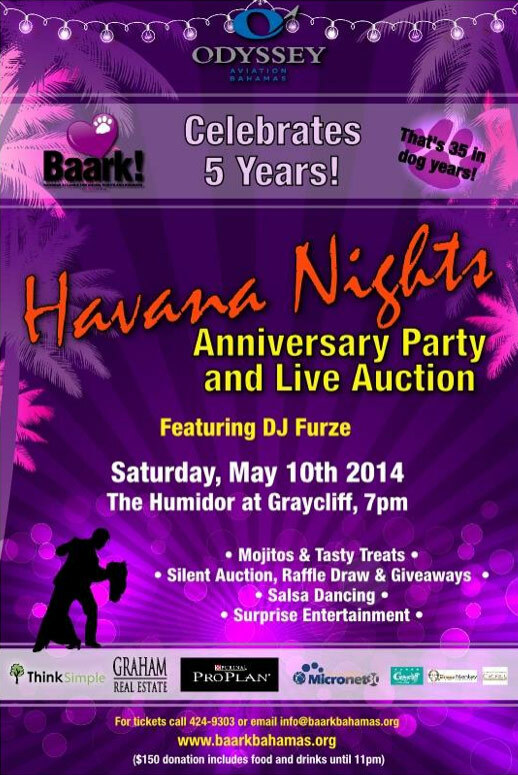 Click here to see Baark’s Havana Nights prizes for a list of all our items generously donated by local businesses. Price includes tasty treats all night, including dessert – plus 3 hours of refreshing mojitos, beers, wine and soft drinks. Spirits are available for purchase. Want to be a VIP? For an additional $200 you’ll get a bottle of Grey Goose vodka (plus mixers), waiter service and a very cool dedicated seating area for you and 3 friends. Limited availability, please contact us asap to reserve. Contact us on 424-9303 to reserve yours now. Huge thank you to our presenting sponsor Odyssey Aviation and event sponsors Think Simple ,Graham Real Estate, Purina ProPlan and Micronet. Event providers include Cacique Intl, Brass Monkey Light & Sound and Graycliff Chocolatier, thank you all for helping us to make this a fantastic event. All proceeds raised will go towards our spay/neuter and education programs. Visit our Facebook page to see visuals of the prizes you can bid on and win (you don’t need a Facebook account to view it).